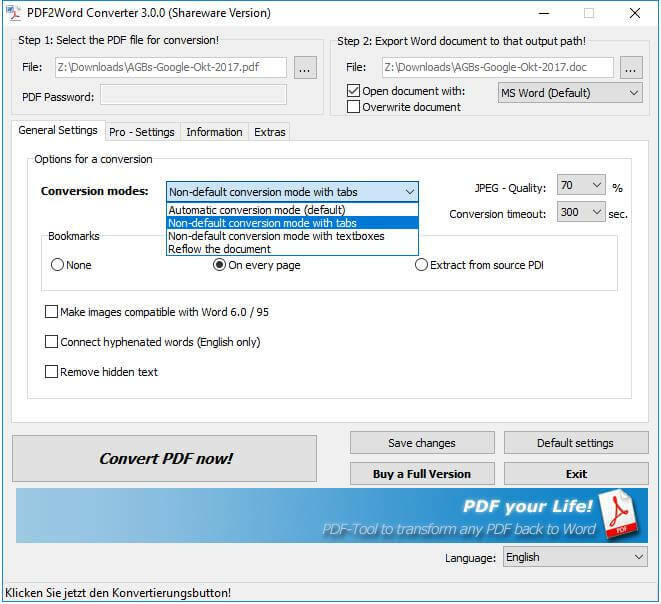 Convert PDF - Here's how! How to convert a PDF document? In which file formats is it possible to convert a PDF file, and what options are there for converting PDF files at all? What are the benefits of a PDF conversion? This article wants to focus on these questions, take a closer look, and answer them. PDF documents can not be changed - or are they? In most cases, PDF documents can not be changed without further ado, meaning that the content of a PDF file can not be changed or edited directly. If you try to open a PDF with a PDF viewer like Acrobat Reader, or if the PDF is displayed with a browser, the possibilities to make changes to the PDF document remain very limited! Can a PDF conversion be the solution? One way to convert PDF files to another format would therefore be a probate solution to allow changes to the PDF document or even make direct. At least if the file format into which the PDF is converted, this would make it easier than the PDF format itself. A file format that would offer this would certainly be the file formats of Microsoft Word (* .pdf → * .docx), or the free word processor LibreOffice (* .pdf → * .odt). If one were to be able to convert the PDF into these file formats, one would then be able to change and edit the content from the PDF directly. A further advantage of this PDF conversion in word processing formats would certainly be that one knows the handling with such word processing programs and these mostly directly on a PC installed. But is it technically possible to convert a PDF? The clear answer is: "Yes, that's possible!" We programmed that years ago and are now so good at converting even large PDF content to Word. 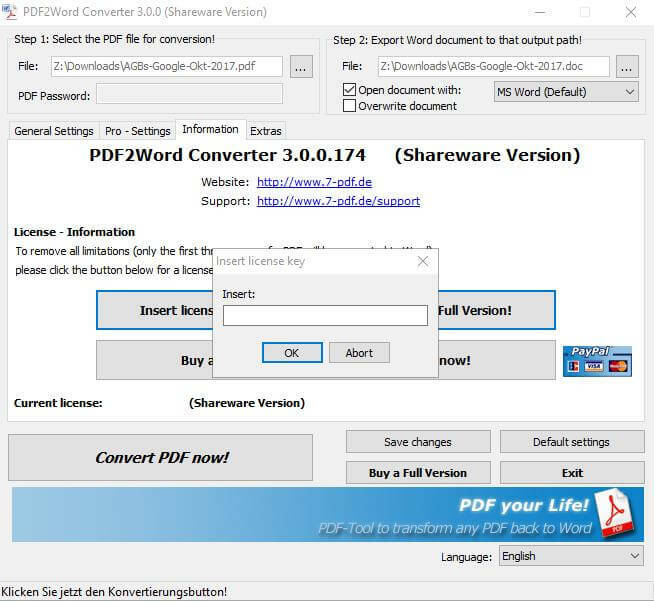 We have developed our PDF to Word Converter. With this PDF tool, you convert complete PDF documents directly into Word. And now mostly without layout losses! But how is that possible? 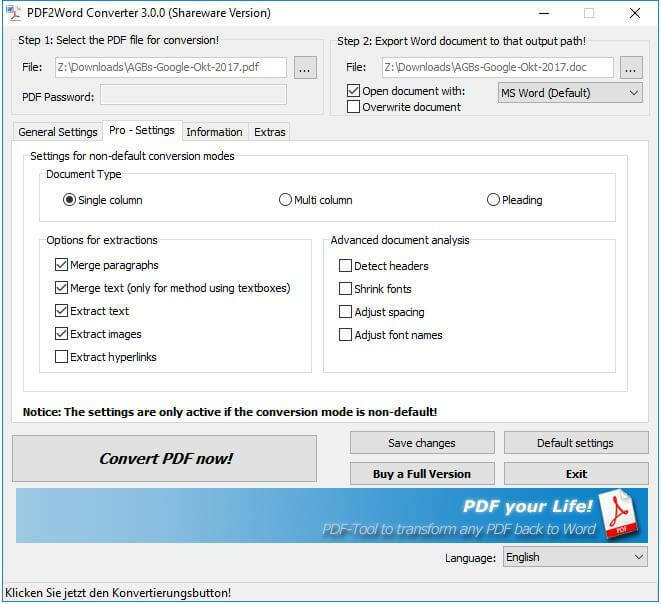 We have steadily improved our PDF Converter over the past few years and have now equipped it with one of the best conversion programming on the market for PDF to Word. To your advantage, then, because with the conversion of PDF documents to Microsoft Word, they will be able to change even complex PDF documents with a familiar word processing software such as Word or LibreOffice! 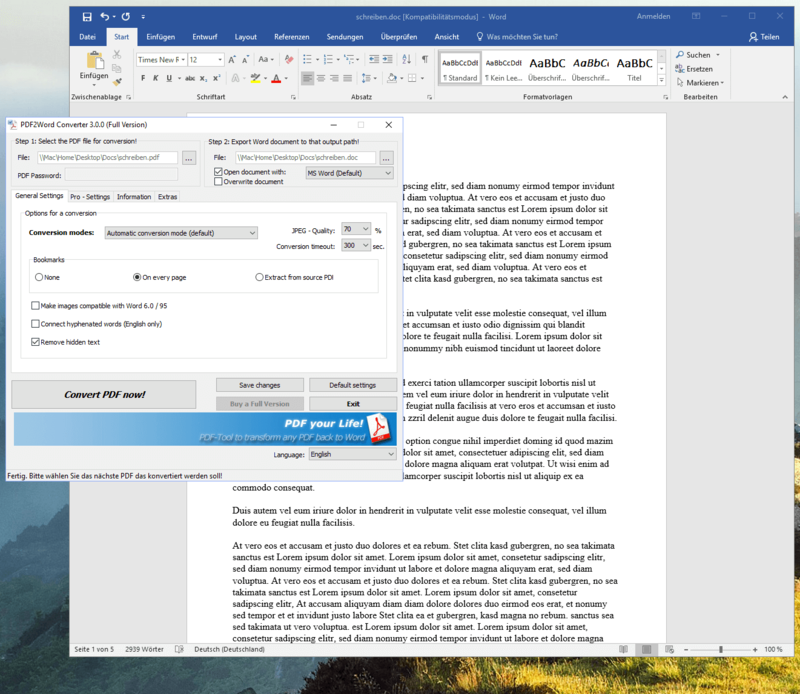 Installed locally, so safe from unauthorized access by third parties, and without having to use an online PDF Converter, will start after the actual PDF conversion on your PC automatically your locally installed Microsoft Word or LibreOffice and shows them just as a PDF document and its Content. After the conversion by the PDF Converter, you can start directly with changes to the PDF content, and redesign and edit the PDF according to your ideas! 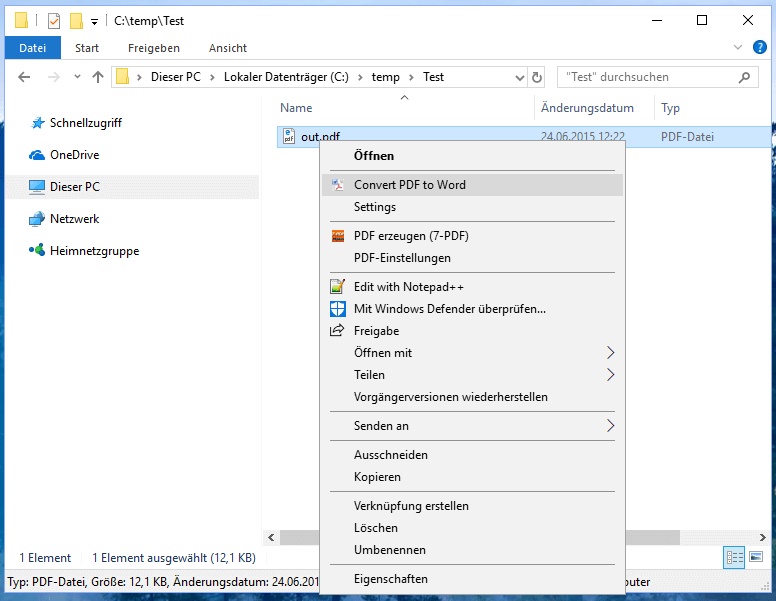 Convert PDF - also directly in the Windows Explorer possible with a single mouse click! And back again? So from Word to PDF - how it works? And if that were not brilliant enough, you can also turn the Word document back into a PDF after completing your editing work on it. We developed our PDF Printer (7-PDF Printer) for this purpose. A virtual PDF Printer (not physically attached to your PC). 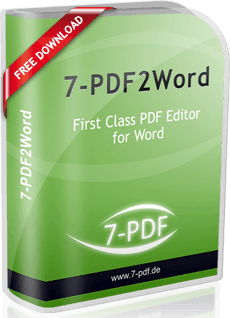 Out of Word, they convert their Word document directly into a PDF using our virtual PDF Printer "7-PDF Printer". With a PDF Printer they are very flexible, because they can, for example, provide the PDF to be created with a PDF background (virtual pdf letterhead), insert a pdf watermark into the PDF, or use the PDF Printer to compress the PDF (shrink PDF), or even to convert to other PDF and graphics formats! 7-PDF Printer is a professional PDF Printer that does not need to shy away from its competitors. The printer is also free in the Community Edition and free for you. So we can stick - converting PDF files has its advantages, because you can then further edit, change and optimize. With our PDF tools like PDF to Word Converter or our 7-PDF Printer we have developed the tried and tested PDF Tools for you. Get started and benefit directly from our software solutions. And if you have any questions, please feel free to use our free support here on https://www.7-pdf.com! The user interface of the PDF to Word Converter is clearly structured and clearly arranged. It is also easy to understand and available in German and English.